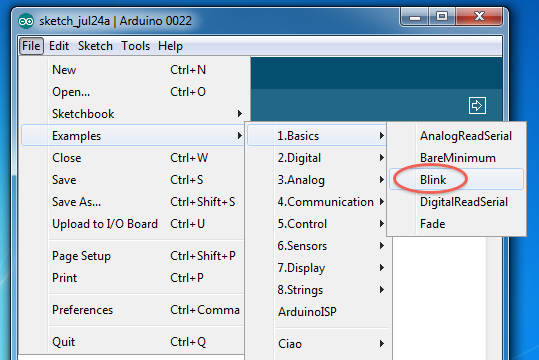 Before you can start using your Arduino board, you have to install and configure the software. Normally, you only have to do this once on your computer, as with most software. There are a few tricky aspects to this process, since the Arduino software is not a native application, especially on Windows. Download the Arduino software package to your computer from here: Download. Unzip the file, and copy the Arduino folder (probably named arduino-0022) where you would like it to reside. I put mine in my Program Files folder. Note that unlike other Windows applications, Arduino does not install itself there automatically, nor will it show up in your Start menu automatically. Plug your Arduino board into a USB port on your computer with the USB cable. You should see a green LED on the board go on if it has power now. If not, uh-oh, that’s a hardware problem with the board. Windows should complain about not having a driver for an Arduino. There are detailed instructions at step 4 of the instructions on this page: Arduino – Windows. This is the tricky part. When you browse to the drivers folder, you won’t see the file it is looking for. Just stop browsing at the drivers folder and let Windows find it in there. Then select the Board (Arduino Uno) and Serial Port (COMn, depending on your system) settings from the Tools menus. You can just try different COM ports, or look in the Device Manager to find out which one is your Arduino board. After a few seconds, you should see the orange LED on the Arduino board start to blink slowly (one second on, one second off). If that all works, you’re good to go. If not, check the Arduino website Troubleshooting page or shoot me an email.